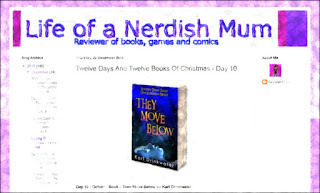 Today I was honoured by the Nerdish Mum book blogger. They Move Below was included in her excellent 12 Books Of Christmas list. I am so chuffed I can't tell you! I don't celebrate Christmas (because I am a weirdo) but this is like all the ones I skipped rolled into one ball of something with icing on. You can read her Day 10 article about They Move Below here.